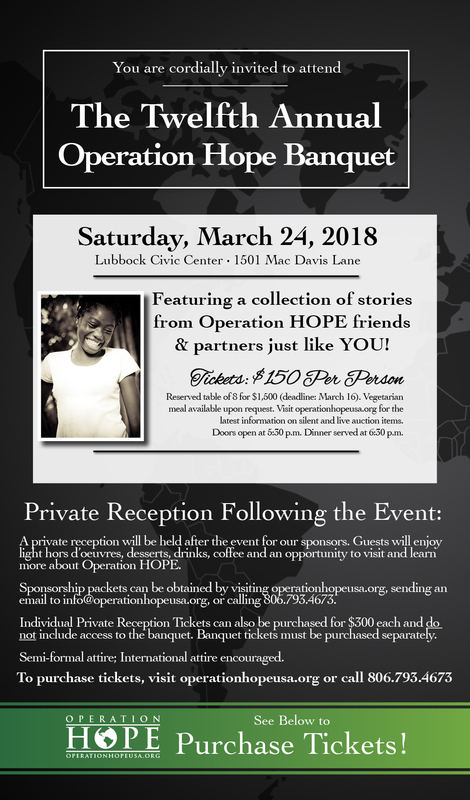 Operation HOPE would like to invite you to the 11th Annual Operation HOPE Banquet coming up on March 25, 2017! 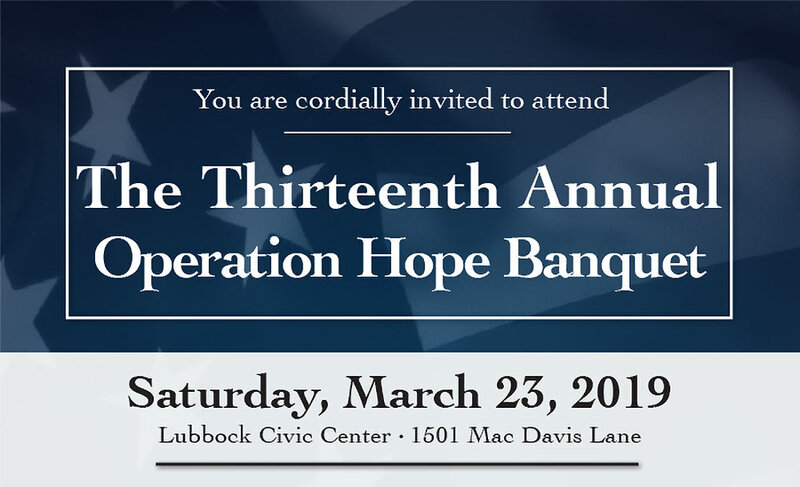 The event will be at the Lubbock Memorial Civic Center and we will be welcoming back our good friend Lt. Col. Oliver North as the keynote speaker! More information & ticket sales will be available early January, 2017. We look forward to seeing you there! Each year, Operation HOPE holds an event to update all of our supporters on the progress being made in Haiti, Iraq, and right here in the US, and to provide them with even more opportunities to invest in these wonderful people. In years past, speakers have included our founder Dr. John Thomas, Pittsburgh Steeler Baron Batch, Former Atlanta Braves Pitcher John Smoltz, Lt. Col. Oliver North, Actor/Director/Producer Kirk Cameron, Dr. Ben Carson, and most recently, Tim Brown. Below are the details for this year's event. This Year, Operation HOPE had our biggest and most successful banquet so far! Each year, Operation HOPE holds an event to update all of our supporters on the progress being made in Haiti, Iraq, and right here in the US, and to provide them with even more opportunities to invest in these wonderful people. In years past, speakers have included our founder Dr. John Thomas, Pittsburgh Steeler Baron Batch, Former Atlanta Braves Pitcher John Smoltz, Lt. Col. Oliver North, Actor/Director/Producer Kirk Cameron, and most recently, Dr. Ben Carson. Below are the details for this year's event. Click the image below to view and download photos from the Tenth Annual Operation HOPE Banquet!